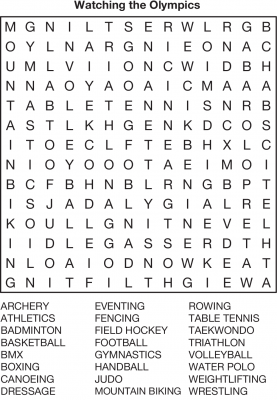 Wordsearches are enduringly popular for both adults and children, and can be made on literally any topic and at any size and complexity. No knowledge is needed to solve them but occasionally it can be gained while solving them! 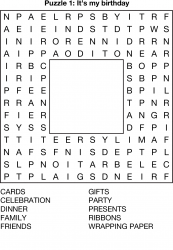 We can make puzzles based on either your word lists or our own - we have several hundred topics on file and can prepare more if needed. Puzzles can be any shape and in particular need not be rectangular, as the samples below show. 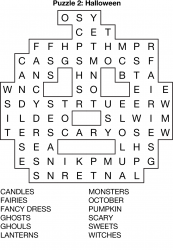 Gaps can be left for art, or the entire puzzle can be sculpted to fit - for a logo, perhaps, or a kids' book. 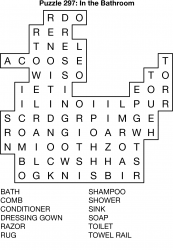 Speciality puzzles can also be created where unusual rules apply - missing letters that must be added, multiple letters in a space, clues to solve to provide the word list, and so on. 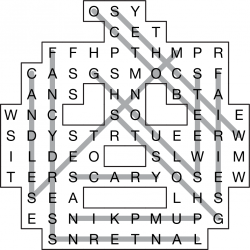 We also make puzzles where the words are not found in straight lines but in other shapes.